Linda S. Vanden Heuvel was born in Green Bay, Wisconsin, and is an avid Packer fan. Linda practices law in Germantown, Milwaukee, West Bend, Appleton, Sturgeon Bay and Sister Bay, Wisconsin, primarily in the areas of divorce and family law, as well as custody and placement. A graduate of Marquette University Law School, Linda is a skilled litigator with the additional ability to negotiate favorable settlements on behalf of her clients. Linda recently published the 2015 book, Divorce in Wisconsin, The Legal Process, Your Rights, and What to Expect. Marquette University Law School – Milwaukee, J.D. 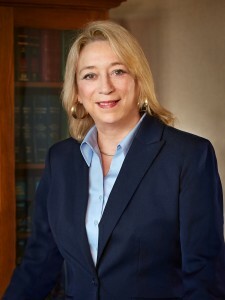 Attorney Vanden Heuvel has been practicing law in Wisconsin for over 30 years and has annually received the highest ratings from www.Avvo.com and www.Martindale.com. She has been named to the National Bar Register of Preeminent Women Lawyers. In 2015 she also received the Client Distinction Award for excellence in service, value, responsiveness and communication ability. In addition to Attorney Vanden Heuvel’s extensive and recognized practice in divorce and family law, she also practices plaintiff personal injury law and is a member of the Million Dollar Advocates Forum and the Multi Million Dollar Advocates Forum. She is particularly experienced in representing the brain injured and those otherwise seriously injured in vehicle accidents. Attorney Vanden Heuvel is acknowledged as one of the top law enforcement attorneys in Wisconsin and litigated the most significant Wisconsin Supreme Court case involving law enforcement. She was admitted to the United States Supreme Court as a result of her representation of a police officer’s wife who was injured by a criminal waiting to “get even” with the police. Linda often litigates cases pro bono because she sees a client or issue in need of representation. She was recently recognized by the New York Times for her successful representation of a pregnant woman wrongfully detained based on a violation of her patient/doctor privilege.